"Storm Boy Drowns in Shallow Water"
STORM BOY is a coming-of-age movie about the special relationship between a boy living in remote Australia and the three baby pelicans he raises. This slow-moving reboot waters down the classic Australian children’s tale with an environmentalist political message, pagan elements, and new unrealistic plot twists that will ruin the movie for all. STORM BOY is a coming-of-age movie about the special relationship between a boy living in remote Australia and the three baby pelicans he raises. It is based on an original novella by Colin Thiele, which is a staple of Australian children’s literature that had already been made into a well-received movie in 1976. The 2019 version of STORM BOY transforms a heartwarming story about childhood and nature into environmentalist political advocacy. The reboot features good performances, touching scenes and contains a welcome plea for families to put relationships ahead of political disagreements. Elements of the beloved original story still shine, but this version waters down the emotion with an environmentalist plot set in the modern day. The movie also presents aboriginal, earth-based spirituality in a positive light while taking the Lord’s Name in vain, and depicts lying as an acceptable means to get ahead. The original story by Thiele is straightforward. In the 1950s, young Michael Kingley (Finn Little) and his anti-social father live alone in Coorong, South Australia. The widower, nicknamed Hideaway Tom, takes his son on fishing trips during the day and homeschools him at night. One day, the lonely boy meets an aborigine named Fingerbone, who shows him three baby pelicans whose mother has been killed by hunters. Michael adopts the three birds, names them Mr. Proud, Mr. Ponder and Mr. Percival, nurses them to health, and tearfully releases them. At a pivotal moment, one of the birds repays their kindness in an unforgettable, if unrealistic, way. Sadly, the 2019 version of STORM BOY surrounds this story with a new narrative arc. An elderly Michael (played in the modern day by Geoffrey Rush) has retired and turned his corporation over to his son-in-law, Malcolm, who wants to drill in an area that will destroy the pelicans’ nesting grounds. Malcolm’s 17-year-old daughter, Maddie, has become so obsessed with environmentalist activism that she openly hates her father and calls her grandfather “gutless” when he refuses to intervene. Will Michael sabotage his own company’s actions or let the “climate criminals” kill the birds he worked to protect? Will the family ever reconcile? The original movie turned around a particularly unrealistic scene. Somehow, with all the special effects available in 2019, the reboot makes it even harder to believe and adds a few more dubious elements to boot. This alone would make the pelican tale hard to swallow for anyone above age eight. This reboot fails, because it reduces a beloved childhood story to a brief for Green political advocacy. In the original story, young Michael learns lessons about life, death and nature. The new version spins this into an environmentalist message that capitalism threatens the world. A pagan ceremony is shown, twice, in a positive light, and lying is presented as a fair way to promote an important cause. There is light drinking and profanity. However, Michael’s gentle plea for Maddie to put her relationship with her father ahead of their political disagreements is a welcome, if understated, message. The reboot features universally good performances, especially by Little and Rush. David Gulpilil, who played Fingerbone in the 1976 original, also makes a cameo. Beautiful Coorong, South Australia, makes an enticing backdrop, which the movie could have used even more. Also, the direction could use some speeding up, because scenes of little consequence linger. The 2019 version of STORM BOY is a lost opportunity to retell a beloved story with a more realistic setting. The movie shortens the original story while beating the audience over the head with a political message. The underlying spiritual issues, political advocacy, and the new unrealistic elements the movie adds to the original will ruin this update for all. Extreme caution is advised for the new STORM BOY. Children are shown being unforgiving and inappropriately spiteful toward their parents and grandparents, although a character also says he regrets this and urges peace later in the movie, plus lying is depicted as a good way to advance an important cause. REVIEW: STORM BOY is a coming-of-age movie about the special relationship between a boy living in remote Australia and the three baby pelicans he raises. It is based on an original novella by Colin Thiele, which is a staple of Australian children’s literature that had already been made into a well-received movie in 1976. The 2019 version of STORM BOY transforms a heartwarming story about childhood and nature into environmentalist political advocacy. The reboot features good performances, touching scenes and contains a welcome plea for families to put relationships ahead of political disagreements. Elements of the beloved original story still shine, but this version waters down the emotion with an environmentalist plot set in the modern day. The movie also presents aboriginal, earth-based spirituality in a positive light while taking the Lord’s Name in vain, and depicts lying as an acceptable means to get ahead. 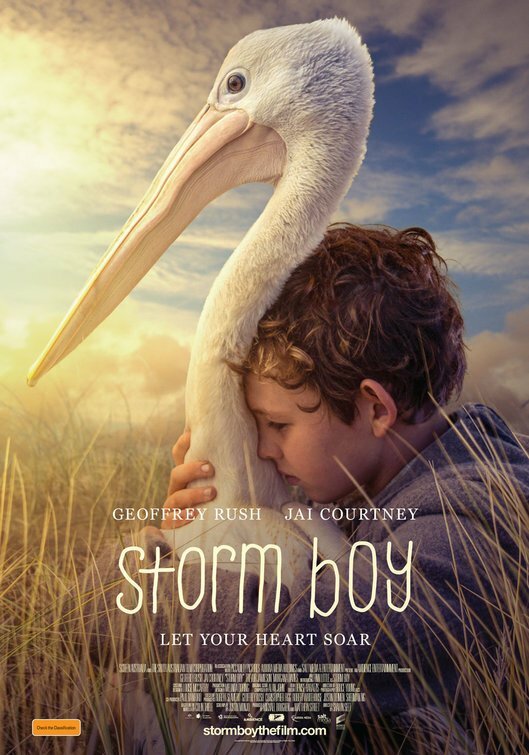 SUMMARY: STORM BOY is a coming-of-age movie about the special relationship between a boy living in remote Australia and the three baby pelicans he raises. This slow-moving reboot waters down the classic Australian children’s tale with an environmentalist political message, pagan elements, and new unrealistic plot twists that will ruin the movie for all. STORM BOY is a coming-of-age movie about the special relationship between a boy living in remote Australia and three baby pelicans he raises. The original book is a staple of Australian children’s literature and was made into a well-received movie in 1976. In the new movie, an elderly man turns his corporation over to his son-in-law, Malcolm, who plans to drill in an area that will destroy the pelican nesting grounds. His teenage daughter, Maddie, is so obsessed with environmentalist activism that she openly hates her father and calls her grandfather “gutless” when he refuses to intervene. The 2019 version of STORM BOY transforms a heartwarming story about childhood and nature into political advocacy. The reboot features good performances, touching scenes and a welcome plea for families to put relationships ahead of political disagreements. However, it waters down the emotion with an environmentalist plot set in modern times. The movie also has some profanities and depicts lying as an acceptable means to get ahead. Extreme caution is advised for the environmentalist, anti-capitalist political advocacy, foul language, and lying in the new STORM BOY.